A whole pizza is too much for you? We thought about that and created Pizza Socks Box Slice! Pizza Socks Box Slice is one pair of your favourite socks packed like a real pizza! Surprise your friends with a unique gift! Pizza Socks Box is the only such product in the whole world. An original concept, multiple colours, and high quality of workmanship are a unique combination that gained the recognition of many supporters in Europe and the USA. Our socks are produced with passion and attention to every, even the tiniest, detail in a small family company in the EU. From there, the socks are transported to a warehouse and then... to different parts of the world! ? Pizza socks are not only a funny but also a practical gift bringing joy that stays with you long after you've opened the box. These cotton socks are soft, extremely comfortable, and are an ideal protection from cold or overheating. Owing to good quality confirmed by Oeko-Tex certificate, the gift recipient will be able to enjoy the socks for a long time, whereas you can be sure that your friend won't forget about the gift that easily! There are as many as five pizza designs available: Italian, Hawaiian, Pepperoni, Capricciosa, and Vegetarian - each of them is a fantastic mix of vibrant colours that won't allow anyone to pass you without a smile! Get a gift for your friends and surprise them with the contents of the pizza box! If one slice is not enough for you, you definitely should check out our Pizza Socks Box containing four pairs available on Amazon. Socks are available in sizes S (36-40) and L (41-46). Sizes are embroidered on the inner side of the socks. Dimensions of the box: 12,5x13x12,5. PIZZA SOCKS FOR EVERYONE - Are you a fan of pizza or colourful socks? Then, Pizza Socks Box Slice is an ideal product for you! The fashion for colourful socks flourishes and you won't be able to find crazier socks than pizza socks that are packed in a box that looks like a real pizza. Our socks look funny and original also on their owner's feet. They match both casual clothes, a pair of jeans as well as a jacket and a suit. Pizza socks are funny, crazy, colourful and happy! ORIGINAL IDEA - Our Pizza Socks Box Slice is the only product of this type on the market. It was invented "from scratch" by a lover of pizza and colourful socks who decided to combine these two things and create Pizza Socks. Pizza Socks Box Slice is a guarantee of an exceptional and unique gift which is an outcome of the love of the popular and beloved Italian meal that is Pizza. If you've got a friend who loves to eat, it is an ideal solution for you ? HIGH-QUALITY EU PRODUCT - Pizza Socks are produced in a small family production plant in Central Europe, where the quality of the product is treated as a point of honour. The cotton that we use during the production process has been confirmed by OEKO-TEX certificate which is an international symbol of the best quality of textile products. Our socks are a competition for the cheap low-quality products from China. Our socks are natural without plastic full print which is very bad for your feet. ATTRACTIVE VARIETIES AND COLORS - We offer a wide choice of "tastes" and sizes. Our offer includes one-pair Pizza Boxes in the following versions: Pepperoni, Capricciosa, Italian, Hawaiian, and Vegetarian. Each type has a unique pattern in vibrant colors that look great on your feet. Pizza Slice is a perfect idea for a small gift for your nearest and dearest. 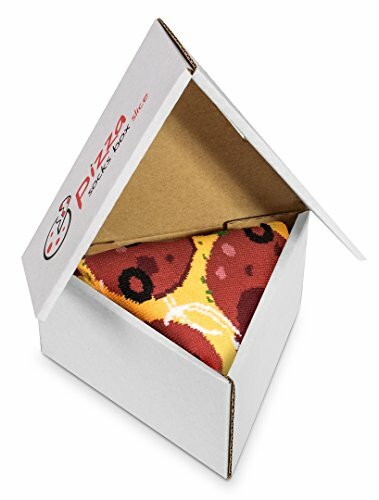 Each Pizza Socks Box Slice comes both in women's size (S) and men's size (L). Wash at 104°F or lower. If you have any questions about this product by Pizza Socks Box, contact us by completing and submitting the form below. If you are looking for a specif part number, please include it with your message.